Somehow this single statue alone can demonstrate at the same time how creative and destructive the human mind can be. The Hindu mythology has a tale of Narasimha’s origin. "Lord Vishnu takes the form of Narasihma in his fourth incarnation, the previous one being that of a Boar (Varaha). Vishnu kills the demon Hiranyaksha during his Varaha avatar. Hiranyaksha’s brother Hiranyakashipu wants to take revenge by destroying Lord Vishnu and his followers. He performs penance to please Brahma, the god of creation. Impressed by this act, Brahma offers him any thing he wants. Once Hiranyakashipu points to a pillar and asks if Vishnu is present in it. Prahlada nods in affirmative. 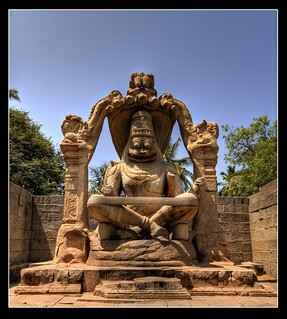 Angered at it, he draws his sword and cuts the pillar; Narasimha appears out of the broken pillar. Narasimha (being a man-lion god form) kills Hiranyakashipu. He comes out to kill at the twilit (neither day nor night);on the doorsteps of his palace (neither inside nor outside); uses his nails to kill (neither animate nor inanimate); puts him on his lap before killing (neither earth nor in space). Thus making power of the boon ineffective. The death of this demon king is celebrated as Holi (the celebration of colors) in India, especially in the northern parts.